Q: When and how did you first get involved with the poetry slam? A: My first slam was at the Nuyorican Poets Cafe in 2001. I tried out vigorously for the team in 2003 and failed. I went out for LouderArts in 2004 and share the Grand Slam Champ title with Michael Cirelli and Roger Bonair-Agard. It was life-changing. And quite honestly, it is the reason I run my slam team like bootcamp. I learned so much about practice, accountability and friendship. Q: For you, what has been the best part of being involved with slam poetry? A: Slam is a vehicle. Like any other art genre, it has some beautiful times and some really unbeautiful and downright ugly times. Q: Assuming it hasn't been all roses and butterflies, what has been the biggest struggle? A: I learned that racism and sexism are extremely prevalent in our slam communities. You can learn a lot about a person from their LiveJournal page. You can learn a lot about a person from their silence too. I learned that we are products of a system that we say we want to overthrow and instead we've become the same destructive machine of that curse. It's like Lord of the Flies filled with snobbish behavior and character assassination. Q: What advice would you give a bright-eyed and bushy-tailed, aspiring performance poet trying to break into the scene? A: There is absolutely nothing wrong with being inspired by our amazing contemporary artists—but there is absolutely nothing wrong with being daring enough to show the world who YOU are. Q: Can you talk a little bit about the work you're doing with Penmanship Books? A: Penmanship currently hosts 12 authors including the 2010 Women of the World Champion, NYC's Youth Poet Laureate, and internationally and nationally recognized performance poets. It was created after my 5th tour of Europe. I was asked for a book, not a chapbook book, and I was chastised for not having something so powerful available. I think it was a professor who wanted to share it with a class. That was a wake-up call. And when I returned to the States, I bombarded so many different book publishers: small press, independent mainly. Most of them weren't interested in my work, even though I had a history of print media, as a freelancer for several highly recognized magazines. Only one small print publisher was interested, but the amount of books I needed, as I was still touring heavily, forced me to branch out on my own. After the first year, I began thinking of my most inspiring peers, and Jaha Zainabu, Falu, Eboni, and Jive Poetic were added to the roster. Their believing in me changed my life and the course of Penmanship Books. Q: On the Penmanship website, it says that you created Penmanship “as the answer to the performance poet's publishing problem.” Why do you think that problem exists? A: The problem still exists because people are afraid of thinking outside of the box. As a Black Woman poet, I recognize who the most notable women writers are. But if you, as a publisher, are not allowing yourself to think about what's being written, instead of the marketable figure that's writing it—then you are failing at life. I was told "we don't publish poetry, unless you are" and you can list Giovanni, Sanchez, Angelou, etc. But the turn of the page will happen when we start pushing the envelope. That means introducing the world to Zora Howard and Aja-Monet. That means introducing your classrooms to Will Evans, Dasha Kelly, and Josh Bennett. The impressively big and exclusive publishers may sell books and make a profit, but if you are not supporting the masterpieces of our time, your life is wack. Q: Can you talk a little about the work you do with the Nuyorican Slam? A: I curate and host the Friday Night Slam series, coach the Slam team, and whatever else needs to be done. I have a great board of directors that allows me to seek new opportunities for our Slammers, allowing them real life and art experiences, including art festivals and college performances. Q: You're a Cave Canem Fellow. What has your experience been like with Cave Canem, particularly with the annual retreat? At first glance, I was writing more cohesively—I was unafraid of trying different things on the page, and I was able to analyze poems with a finer toothed comb. Upon returning for my second year, I was floored. I was surrounded by family and people who became fixtures in my life. The second year, I went in like a beast.I wrote all night, I wrote extravagant things and I had the pleasure of working with people who I'd read about. They were amazing. And uncompromising. And aware. It says something to be surrounded by people who understand your struggle even though they were from a faraway place. Brooklyn ain't nowhere near Kentucky or Arkansas, but with them, I felt like I'd met them before. It was the closest experience I've had to déjà vu. Q: What poets do you go back to when you're stuck? A: I go back to Ai, Jan Beatty, Terrance Hayes, Pearl Cleage, Patricia Smith. I go back to everyone. I read nonstop. And I write an hour a day. I figure if I won't work out physically, I might as well do my writing stretches. Q: Do you have any favorite writing prompts? A: Twitter. I have a new book of poems that are all 140 characters or less. It just began as a writing prompt. Easy enough. Every morning write a string of thoughts. And it helped. Immensely. If that doesn't help, Facebook Status. If that doesn't help, haiku. I learned the smaller the form, the easier to find the light. I also love a good 30/30. Pick a core group to write and critique with— it's refreshing and makes you check your "everything is gold" crap at the door. It's a great lesson on the creation of art, editing your art, building a better and more open artistic community. And it's free. Ain't much better than that. Q: Are there any other projects you're working on that people should know about? A: I recently released my Dear Twitter book of tweets and word art. It's available in stores and at SPD and Amazon. And I am currently working on my one woman multimedia show. I am excited. It is the first time I have actually participated in a show that is all about me and my art. It's scary, but definitely long overdue. Q: What do you do when you're not running Penmanship Books or hosting at Nuyorican? A: I facilitate workshops for several organizations, including Urban Word NYC. I produce different events throughout NYC with Jive Poetic like the Brooklyn Slam (1st Thursday of the month). I am the owner of PoetCD and a mother. I have a 13-year-old. She is pretty fukn amazing. The Cave Canem Fellow is the Editor of the women's anthology His Rib: Stories, Poems & Essays by HER and author of several books, including her latest book of poems: Swag. She has released five LPs, including the live album Sheroshima. As co-founder of the Off Broadway poetry production, Jam On It, and co-producer of NYC’s 1st Performance Poetry Festival: SoundBites Poetry Festival, Mahogany bridges the gap between lyrical poets and literary emcee. Her freelance journalism can be found in magazines Uptown, KING, XXL, The Source, Canada's The Word, and UK's MOBO. She is an Urban Word NYC mentor, as seen on HBO’s Brave New Voices, and facilitates performance poetry and writing workshops throughout the country. She is the publisher of Penmanship Books, a small press for performance artists and owns PoetCD.Com, an online marketing and distribution company for poets. 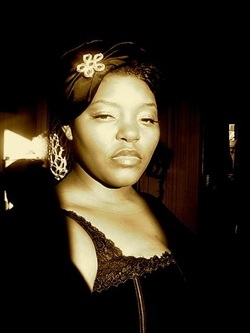 Mahogany is currently host and curator at the Nuyorican Poets Cafe.